The Victory Fighting Championship, the premier mixed martial arts organization in the Midwest, is excited to continue its partnership Special Olympics Nebraska. A portion of each ticket sold for the Saturday, March 30th event will benefit over 5,000 intellectually disabled Nebraskans. Tickets for the event are on sale now. A trio of UFC veterans will square off at the new Ralston Arena against some promising, up and coming, fighters with no shortage of “big show” experience themselves. Ryan Roberts faces WEC and IFL veteran L.C. Davis for the Victory Fighting Championship (VFC) Bantamweight Title. 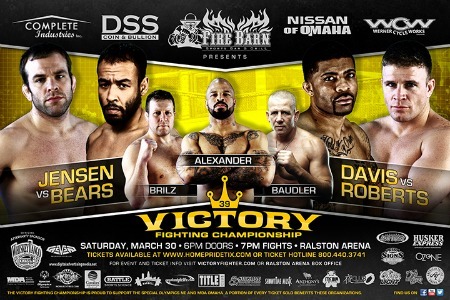 Eight-time UFC veteran Ryan Jensen will meet Rudy “Bad News” Bears, and Omaha’s own Jason Brilz will fight in the VFC squared cage for the first time since 2005. In December, Victory Fighting Championship 38 drew 3,700 people to the Ralston Arena - which remains the attendance record for the venue - and outsold the UFC on FUEL earlier in the year. From the proceeds, $1,722 was donated right back to Special Olympics Nebraska. Tickets are available at www.homepridetix.com.